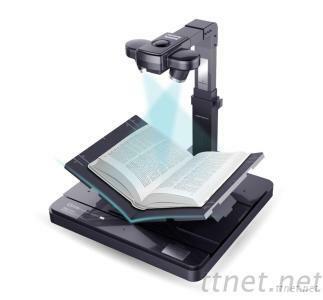 Czur M2030 book scanner is Chinese best book scanner. With the robust algorithm, it can rapidly digitalize the content that is locked away in both bound and un-bound documents. M2030 can complete one page scanning in one second, which means in the normal use of scenarios, one person can scan 60 pages in one minute. With user-friendly physical interface, you can easily work for long time without any discomfort. Czur M2030 intelligent software can automatically handle the complicated work including distortion correction, page extraction, background purification and so on. Using M2030, all you need is to turn page of books or documents without any interruption, other work can be left to the hardware and software. 1.Dual webcam with the technology solution of HD CMOS to show you the best quality of pictures. 2.High speed scanning shortens the imaging time to 1s/page. 3.The output format of the video is YUV and the transmission speed is 20 FPS. 4. Finish the scanning easily without removing stapling. 5. AF autofocus can avoid the complication of manual focus. 6.Scan two pages at the same time. 7.LED light can satisfy the demand of scanning in the dark. 8. Energy-saving technology is used by the 9V adapter. 9. Intelligently correct deformation, flatten curve, extract page, erase fingerprint and purify background etc. 10. Generate the file with easily operation. 11. Provide SDK to support secondary development. 12. The perfect combination of metal and plastic brings a mysterious technology style and makes the product more unique and charm. CZUR TECH CO., LTD. is committed to promote the development of smart hardware and software for business. The main object is to solve scanning problems for business people. Our goal is to change the traditional way of scanning. We hope that our customer can enjoy the happiness of scanning. Through providing hardware, software and cloud service, we will make the office more intelligent and make the world a better place. ​More time for fewer great masterpieces. Computers & Information Technology, Commercial Electronics, Commercial Electronics/n.e.s.